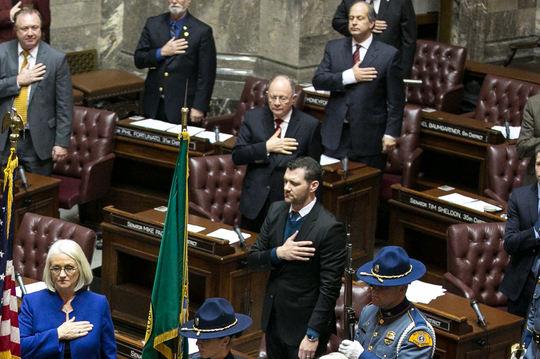 If you have questions about anything in this report, or anything else related to the Legislature, please give me a call at (360) 786-7606 or send me an e-mail at Mike.Padden@leg.wa.gov. Thank you for the opportunity to represent you in the Legislature. If you visit Olympia while the Legislature is in session this year, please do not hesitate to stop by our office and say hello. We are located in 106 Irv Newhouse Building. 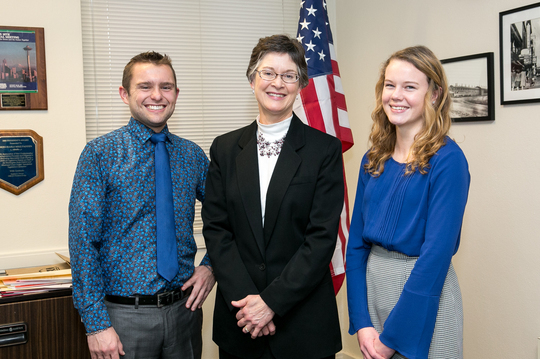 This year my legislative assistant is Janet Voye, my session aide is Thomas Trull, and my session intern is Karlie Lodjic. Janet was part of the team when I was first elected as a Representative, from 1981-1984, and joined my Senate staff this past year. She lives in Spokane and runs the district office in Spokane Valley during the “interim” between legislative sessions. Thomas was born and raised in St. Louis, Missouri, the second of seven kids. He graduated from Thomas Aquinas College in Santa Paula, California, graduating in 2015. Karlie grew up in Sedro-Woolley and is a junior at Western Washington University in Bellingham, studying political science. This bill, modeled after a similar law in California, would make it easier to sue and win, regardless of whether real discrimination is taking place within elections, or if changing the boundaries of political/electoral districts would actually improve anything. As in California, it would likely lead to over-inflated judgments, which municipalities and school districts would be forced to pay using taxpayer money. A 2015 analysis of 25 lawsuits filed under the California law showed that at least $13.8 million of public money was paid to plaintiffs’ attorneys in cases against everything from school boards to hospital districts. Should the Washington bill be adopted, the cities of Spokane, Spokane Valley and Liberty Lake, Spokane County and numerous other municipalities would be at risk of having their election systems uprooted and thrown into utter chaos. 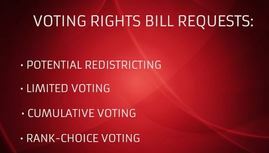 The measure could lead to forced redistricting and the use of controversial alternative voting methods. Click here to watch TVW coverage of Sec. 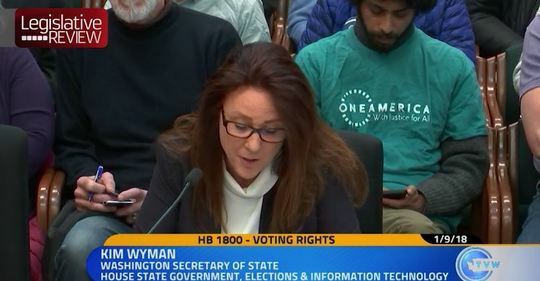 of State Kim Wyman's testimony on the Washington VRA. I do not believe HB 1800 is necessary because the federal Voting Rights Act of 1965 applies to Washington just as it does in all fifty states. Over the past half-century, that Voting Rights Act has done an outstanding job of eliminating obvious forms of discrimination like the poll tax, or literacy tests. The federal law also covers more subjective forms of perceived discrimination, such as the manipulation of at-large voting and/or redistricting to quash the political power of minorities. Given that the goals of HB 1800 are already achievable under the federal act of 1965, there is no reason to think that this local legislation would be an improvement – indeed, it is likely to cause more problems than it would fix. The centerpiece of Governor Inslee’s 2018 legislative agenda is the creation of a new energy tax. What he calls “carbon pricing” is really a tax on home heating and fuel. This energy tax would not be constitutionally protected and dedicated to a specific purpose, the way Washington’s gas tax must go toward paying for roads. Instead, it would create revenue for the state to spend however it sees fit, while carving out exemptions for some at the expense of others – effectively picking winners and losers. According to Todd Myers of the Washington Policy Center, the $1.5 billion energy tax would add 20 cents per gallon of gas, which would balloon to 6% per year (3.5% plus inflation). So by 2029, the tax would be about 36 cents per gallon. Finally, WPC points out that energy-tax schemes like the one proposed by Governor Inslee have often led to a slowing of the economy and the loss of jobs. One of the hardest hit businesses would be Kaiser Aluminum in Spokane Valley and the steelworkers it employs.